SELF ADHESIVE FELT PADS: Available in several sizes and colors. Just peel and stick. Use thinner pads to protect your household items. 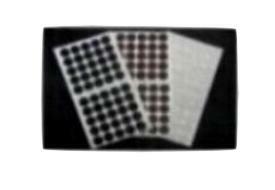 Use thicker pads on table and chair legs to protect your wood, tile, marble or linoleum floors. SAP316-100: 3/16" diameter x 1/16" thick self-adhesive felt pads. Your choice of Black, Dark Chocolate Brown or Snow White color. Pack of 100 pads for $4.00. 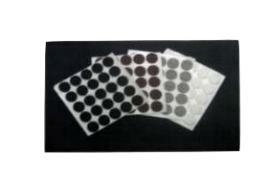 SAP5161BK-120: 5/16" diameter x 1 MM thick Black self-adhesive felt pads. Pack of 120 pads for $4.25. SAP516BK-120: 5/16" diameter x 1/16" thick Black self-adhesive felt pads. Pack of 120 pads for $4.50. 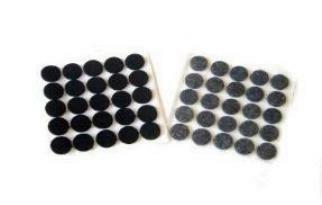 SAP381BK-100: 3/8" diameter x 1 MM thick Black self-adhesive felt pads. Pack of 100 pads for $4.75. SAP38-100: 3/8" diameter x 1/16" thick self-adhesive felt pads. Your choice of Black, Dark Chocolate Brown or Snow White color. Pack of 100 pads for $5.00. SAP3818BK-100: 3/8" diameter x 1/8" thick Black self-adhesive felt pads. Pack of 100 pads for $6.00. 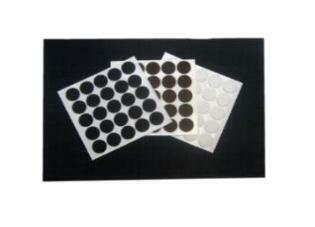 SAP121BK-100: 1/2" diameter x 1 MM thick Black self-adhesive felt pads. Pack of 100 pads for $6.00. SAP12-100: 1/2" diameter x 1/16" thick self-adhesive felt pads. Your choice of Black, Dark Chocolate Brown or Snow White color. Pack of 100 pads for $6.50. 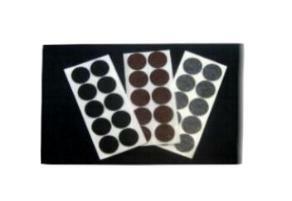 SAP1218BK-100: 1/2" diameter x 1/8" thick Black self-adhesive felt pads. Pack of 100 pads for $7.50. SAP58-100: 5/8" diameter x 1/16" thick self-adhesive felt pads. Your choice of Black, Dark Chocolate Brown color or Snow White color. Pack of 100 pads for $7.00. SAP5818-100: 5/8" diameter x 1/8" thick self-adhesive felt pads. Your choice of Black, Brown (Plum/Wine), Grey or Snow White color. Pack of 100 pads for $8.00. 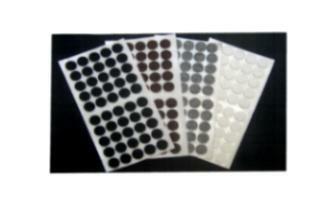 SAP341BK-100: 3/4" diameter x 1 MM thick Black self-adhesive felt pads. Pack of 100 pads for $7.00. SAP34-100: 3/4" diameter x 1/16" thick self-adhesive felt pads. Your choice of Black, Dark Chocolate Brown or Snow White color. Pack of 100 pads for $7.50. SAP3418-100: 3/4" diameter x 1/8" thick self-adhesive felt pads. Your choice of Black, Brown (Plum/Wine), Dark Grey or Snow White color. Pack of 100 pads for $9.00. SAP3414BK-100: 3/4" diameter x 1/4" thick Black self-adhesive felt pads. Pack of 100 pads for $14.50. SAP78BK-120: 7/8" diameter x 1/16" thick Black self-adhesive felt pads. Pack of 120 pads for $8.00. 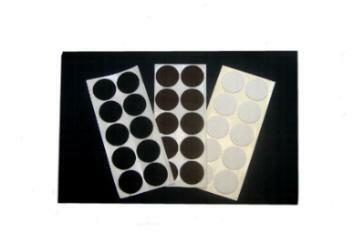 SAP1BK-100: 1" diameter x 1/16" thick Black, Dark Chocolate Brown or Snow White self-adhesive felt pads. Pack of 100 pads for $10.50. SAP118: 1" diameter x 1/8" thick self-adhesive felt pads. Your choice of Black, Brown (Plum/Wine), Grey or Snow White color. Pack of 50 pads for $9.00, Pack of 100 pads for $14.00. SAP114: 1" diameter x 1/4" thick self-adhesive felt pads. Your choice of Black and Dark Grey. Pack of 50 pads for $9.00, Pack of 100 pads for $16.00. SAP125: 1 1/4" diameter x 1/16" thick self-adhesive felt pads. Your choice of Black, Dark Chocolate Brown or Snow White color. Pack of 50 pads for $7.50, Pack of 100 pads for $13.50. SAP12518: 1 1/4" diameter x 1/8" thick self-adhesive felt pads. Your choice of Black, Brown (Plum/Wine) or Grey color. Pack of 50 pads for $8.50, Pack of 100 pads for $14.50. SAP15: 1 1/2" diameter x 1/16" thick self-adhesive felt pads. Your choice of Black, Dark Chocolate Brown or Snow white color. Pack of 50 pads for $9.00, Pack of 100 pads for $15.00. SAP1518: 1 1/2" diameter x 1/8" thick self-adhesive felt pads. Your choice of Black, Brown (Plum/Wine) or Grey color. Pack of 50 pads for $12.00, Pack of 100 pads for $20.00. 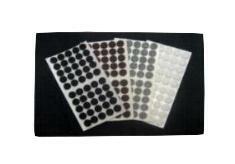 SAP1514BK: 1 1/2" diameter x 1/4" thick Black self-adhesive felt pads. Pack of 50 pads for $12.00, Pack of 100 pads for $22.00. SAP2BK: 2" diameter x 1/16" thick Black self-adhesive felt pads. Pack of 50 pads for $11.00, Pack of 100 pads for $19.00. 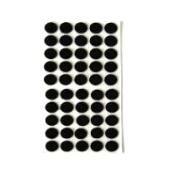 SAP218BK: 2" diameter x 1/8" thick Black self-adhesive felt pads. Pack of 50 pads for $14.00, Pack of 100 pads for $25.00. SAP2125-12: 2 1/4" diameter x 1/16" thick Black self-adhesive felt pads. Pack of 12 pads for $7.00. SAP25BK-12: 2 1/2" diameter x 1/16" thick Black self-adhesive felt pads. Pack of 12 pads for $7.25. SAP275BK-12: 2 3/4" diameter x 1/16" thick Black self-adhesive felt pads. Pack of 12 pads for $7.50. SAP334BK-12: 3 3/4" diameter x 1/16" thick Black self-adhesive felt pads. Pack of 12 pads for $9.00. SAP4BK-12: 4" diameter x 1/16" thick Black self-adhesive felt pads. Pack of 12 pads for $11.00.